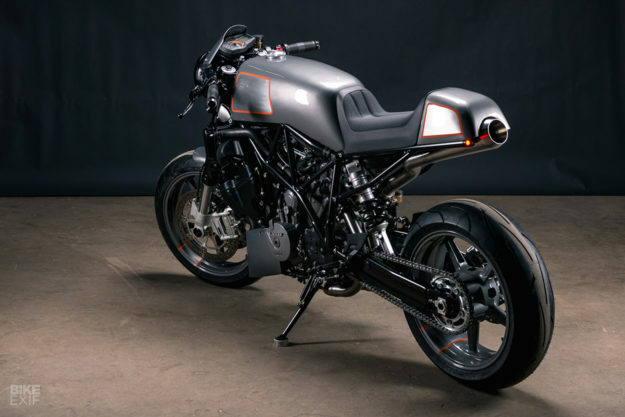 You’d be surprised at how many custom motorcycle builders ride ‘regular’ bikes day-to-day. 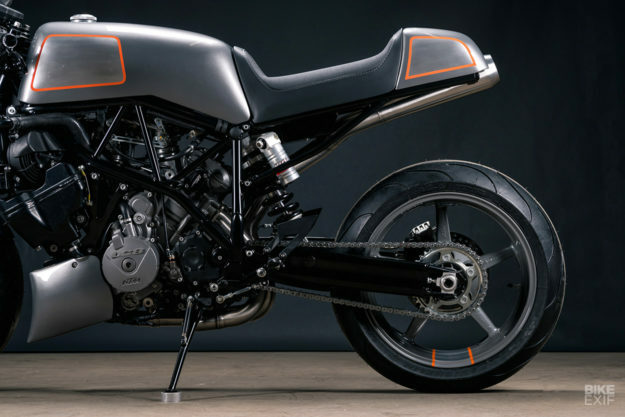 Tony Prust over at Analog Motorcycles has an affinity for KTMs; he’s owned several over the years, and they’ve all been mostly stock. 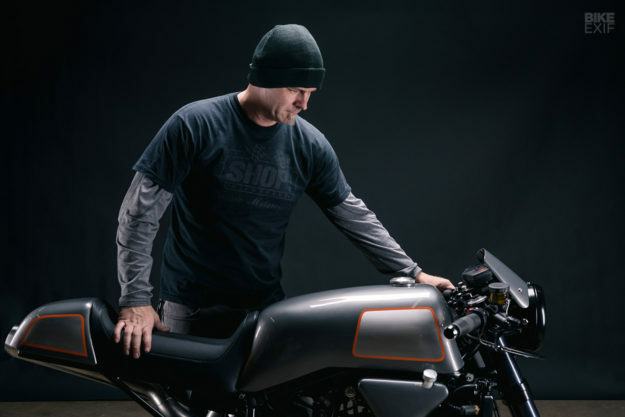 Tony eventually sold the 990 and bought a newer 1290 Super Duke—but couldn’t shake the feeling that the 990 had potential as a donor. Thankfully the opportunity eventually presented itself, via a new client. 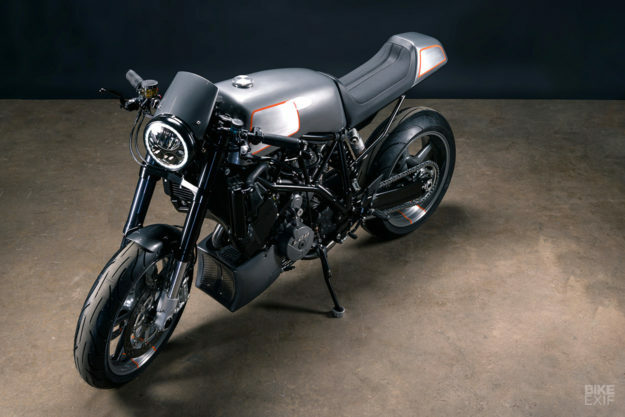 “The client is an avid motorcycle enthusiast, and first contacted me last year,” Tony recalls. 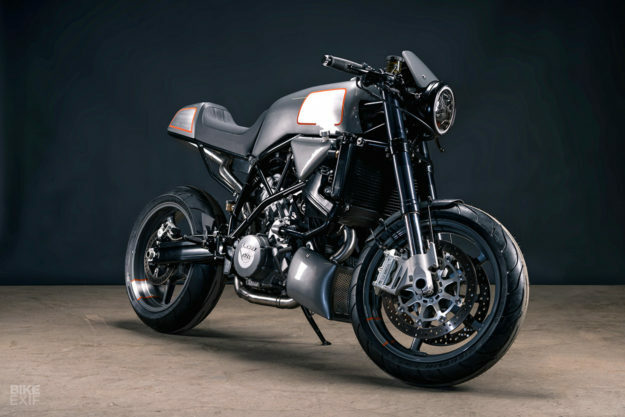 With a suitable donor (another 2007 Super Duke) sourced and on the bench in the Illinois shop, it was time to tick another box—because Tony’s slowly been learning the art of metal shaping. He used to farm out metal shaping tasks on his builds, but he’s gradually started turning out smaller parts himself—like fenders or side covers. 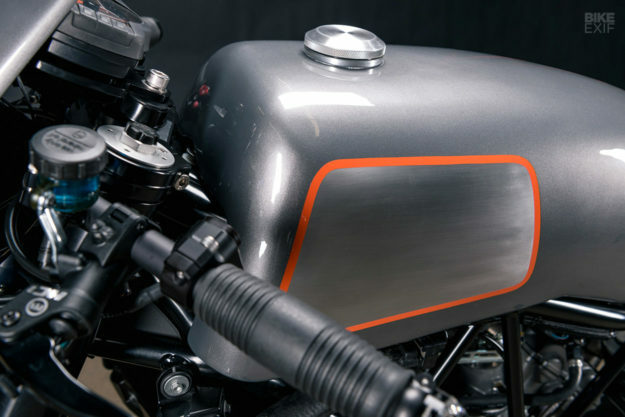 For the KTM, he set out to shape all the bodywork himself—which would mean building his first fuel tank. So the subframe, tank, tail section, fly screen, front fender, belly pan, and even a radiator reservoir cover, were all built in-house using aluminum. 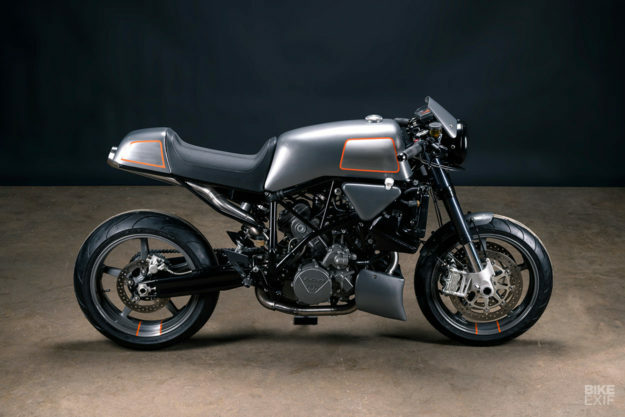 The new shapes have given the Super Duke a radically different silhouette—but that’s only half the picture. Analog made a slew of smaller changes too, to help tie the build together. 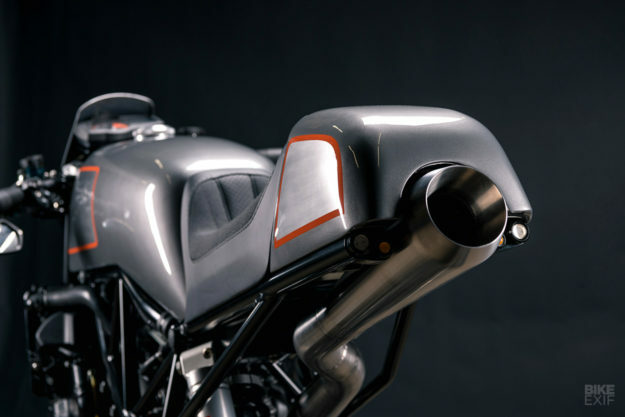 For the exhaust, they added a custom-made connection just after the stock headers’ two-into-one joint, flowing into a stainless steel Cone Engineering muffler. And they installed a Moto Hooligan intake kit to help the KTM breathe better. Moving to the cockpit, the stock bars were swapped out for a set of Vortex clip-ons, and the OEM speedo relocated with a one-off bracket. The headlight’s a Denali Electronics M7 DOT LED unit, mounted up inside a traditional bucket on custom mounts. 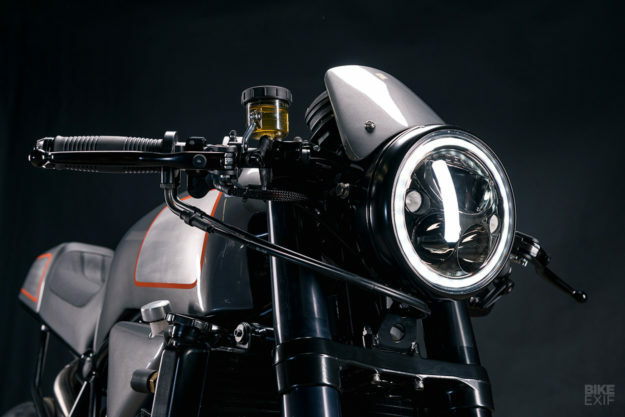 For the taillight, Analog mounted up a pair of prototype red LEDs with their existing LED turn signals, mounting them discreetly alongside the exhaust can. 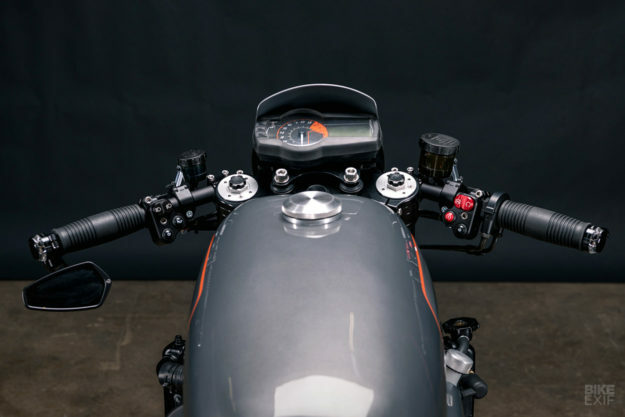 The front signals are bar-end numbers from Motogadget. For switches, Analog fitted units that they import and sell, from Renard Speed Shop in Estonia. They’re bolt-ons for modern bikes that negate the need for excessive rewiring—but Analog rewired most of the bike anyway, to slim down and hide as many components as possible. They also upgraded the clutch and brake controls to Magura HC1 radial pumps. 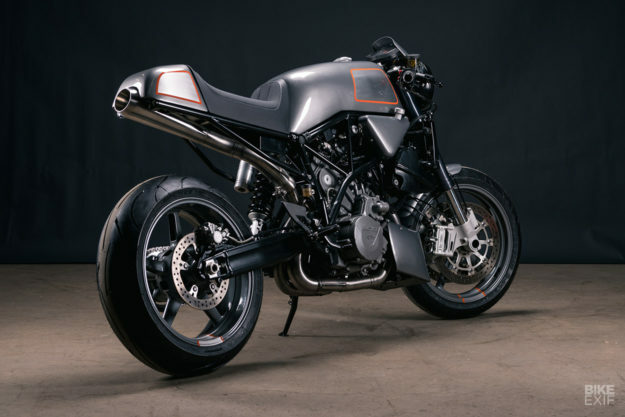 When it came time to paint, Tony wanted to show off some of the bare metal—and keep a little of KTM’s signature orange in the mix. So they sanded down some strategically placed panels, before Jason at Artistimo laid down a grey and orange paint scheme. The Super Duke was stripped down, and all the important bits sent of for powder coating. The rims were torn down, and a section on each hand-sanded to match up with the bike’s livery. Dane at plz.b.seated upholstered the perch, with a mix of solid and perforated leather, and gripper vinyl.